This equipment abandoned the original rotary tank feeding concept and has a newly designed double station canned filling The single-row main and supplementary double-head filling system and the original feeding tank system ensure high precision and solve the inconvenience of cleaning the rotary-plate feeding tank system problem. It mainly completes high- precision filling metering work. It can work with other equipment to make up a completed canning production line, Suitable for canned milk powder, protein powder, chicken powder, glucose, rice powder, cocoa powder, solid drink, etc. 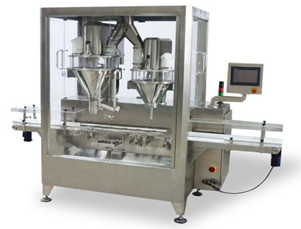 1.Single row double head filling which have main and supplementary filling can ensure high canned filling accuracy. 2.Servo and pneumatic system control cans and leveling cans, accurate and fast. 3.Servo motor and servo drive control the screw, stable performance and high precision. 4.All stainless steel construction;Horizontal open material box (inside and outside polishing), convenient to clean. 5.PLC control system, touch screen man-machine interface display, easy to operate. 6.The high reaction speed weighing system guarantees high accuracy. Application︰ Suitable for canned milk powder, protein powder, chicken powder, glucose, rice powder, cocoa powder, solid drink, etc.